Another fantastic free plugin that is completely original in its design. It's always nice to see plugins that go beyond a recreation of something from the past [Although we do love those too!]. 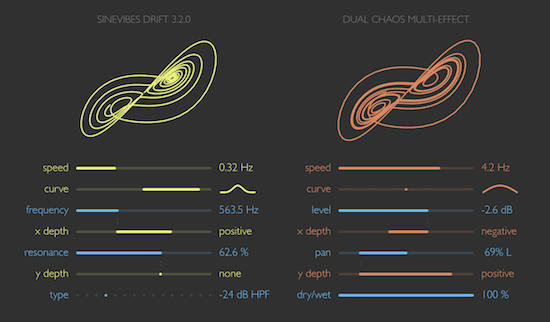 Described as a dual chaos multi-effect, drift is based upon two independent Lorenz chaos oscillators. According to Sinevibes, these systems are used by scientists to model convection in liquids and gases: they produce chaotically fluctuating, never-repeating signals that are mutually correlated. As we said, very original for audio processing. Check out the plugin with the Korg Minilogue in the video below. For all you PC guys used to getting all the free goodies, unfortunately Drift is Mac only! But if you're an Apple owner interested in any form of sound design, this freebie is not to be missed.